Connect Salesforce & Force.com Apps with live external data. Our API Server is the fastest way to connect to real-time data from over 140+ applications, databases, and Web APIs from Salesforce1 and Force.com applications. to our API Server through OData. Direct connectivity between Salesforce 1 & your data (no middle-man). Optimized for real-time data access. Connect Salesforce with over 140+ applications, databases, and Web APIs. Just Getting Started with Lightning Connect? Access real-time NetSuite data from Salesforce using the NetSuite OData Connector. Salesforce1 provides users with a feature-rich platform for building apps, integrating data, and automating business processes. To take full advantage of the Salesforce1 platform, our API Server offers a straightforward way to connect Salesforce1 with live data from a wide range of back-office data including on-premise and cloud databases, ERP systems, accounting, and more. Our API Server create OData entry-points for your back-end data, allowing your Salesforce1 applications to access back office data in real-time. Connect to live back-office data. No ETL required. Building applications on Salesforce 1 with real-time data connectivity has never been easier thanks to our API Server. Our API Server seamlessly translates OData requests from Salesforce 1 into various database, API, or Web service calls to back-end systems. The resulting data is then mapped and returned to Salesforce as a set of simple data tables. This allows users to build Salesforce applications faster, easily navigating back-end data through familiar relational database interfaces. Download and install a free trial of the API Server - available for more than 140+ databases, applications, and Web APIs. Configure the API Server OData entry-point and define the external data source within Salesforce Lighting Connect. Connect to real-time data from any supported back-office system, directly from Salesforce 1 cloud applications. As an on-premise solution, you have complete control over access to your back-end data. You never have to expose your data to the risks / complications inherent with a hosted solution. The API Server gives you an easy, fast, and effective way to connect Salesforce 1 to your back-end data. as well as 140+ cloud-based and on-premises services and applications. 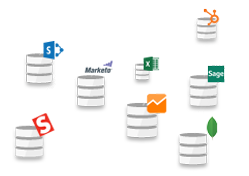 world-wide choose CData for Salesforce integration. Send us an Email and a member of our team will contact you with more information.